I am so excited to say that I made a succulent wreath. I actually made two of them! Needless to say I am a tiny bit proud of myself. Now, if I can keep them alive. Every year we do Christmas with two other families and this year I decided to make something. I try to be thoughtful with my gifts, but many times it is the last hour and I’m running around like a mad woman. This year time was on my side. We were not able to get together until last weekend. Yes, that is right Christmas in March. After we settled back into our normal crazy (back in January) I landed on the succulent wreath. If you get anything from me that is any sort of creative, it is going to be a plant or plant related. Here were the steps I took to make it. 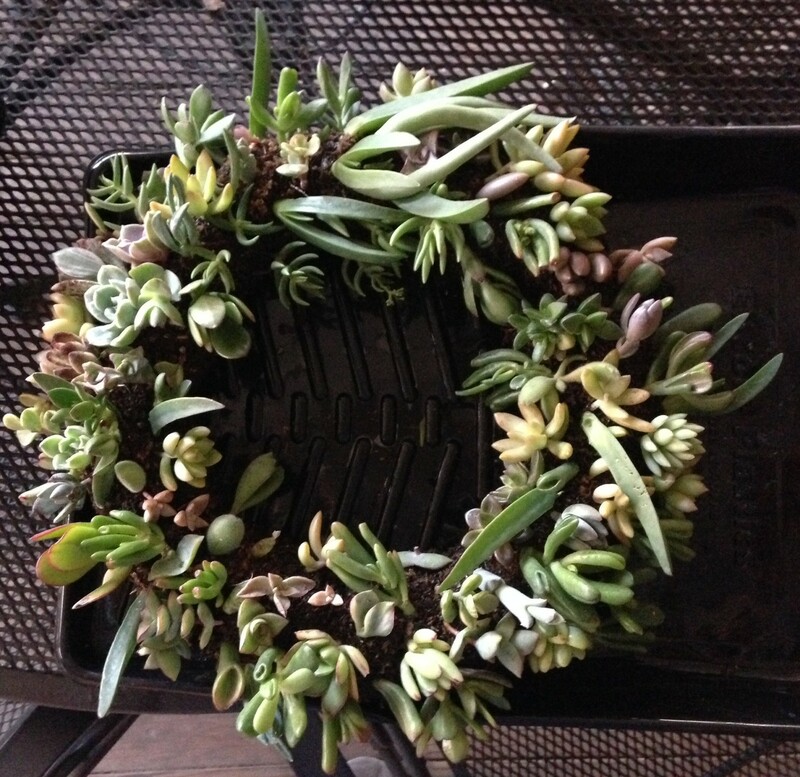 Step 1: You need a succulent wreath, I purchased one at Gecko Hardware, http://geckohardware.com/Home.html. I recommend you buy the smallest one you can get (for your first one) because they are more time consuming than you would expect. 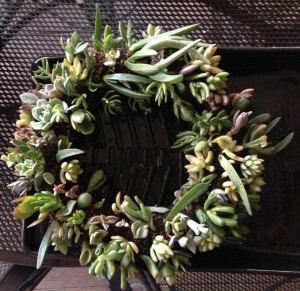 Step 2: Soak your wreath in fertilized water. I put mine in a paint tray and it worked perfectly. 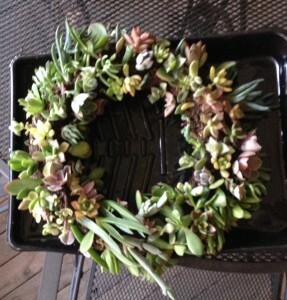 Step 3: My succulent wreath was covered in mesh. I used a pencil to poke a hole into the wreath and put the succulent stem into the hole. You do not want to make the hole too big or the succulent will fall out. 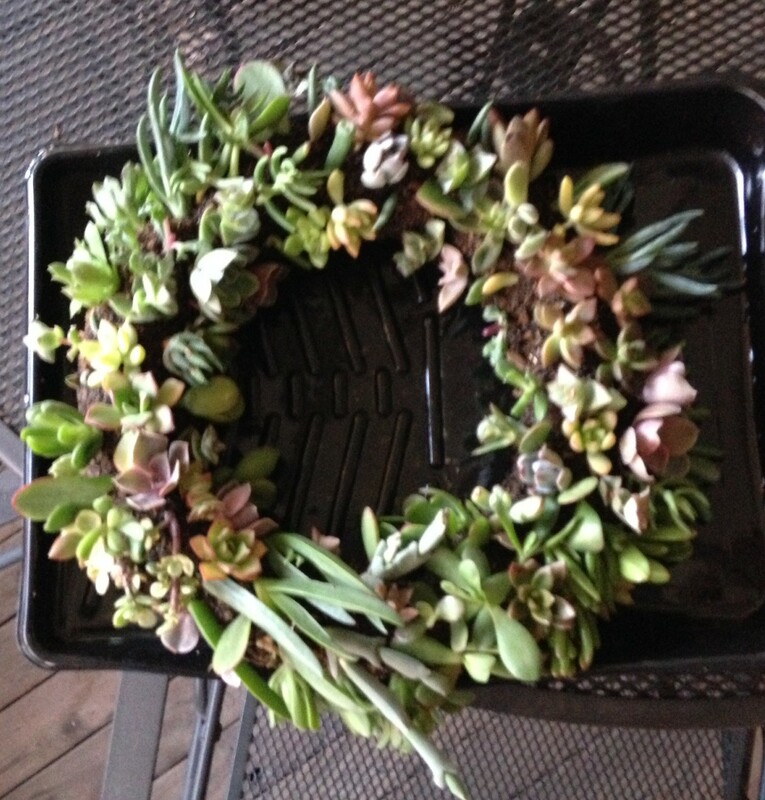 Then Voila you have yourself a succulent wreath. I made these two Friday, March 7h and they are still kicking. I have given them to their new owners, but I am plant sitting until they both move. I think they will look great as a table center piece with a candle in the middle. When they get to their new homes I will send pictures.